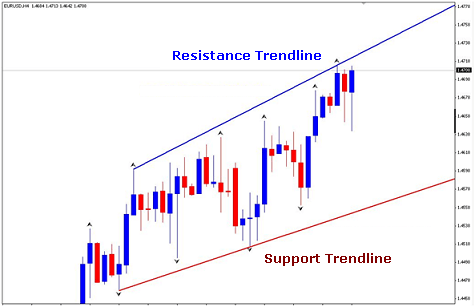 An important part of technical analysis of the forex market (foreign exchange market) and other financial markets, is the concept of support and resistance. Almost every Forex trader makes use of this concept in one form or another and the novice traders who do not hit their forex trading capital sooner or later lose (usually sooner). There are support and resistance levels for all time periods on a forex chart: 5 min, 15 min, 30 min, 1 hour, 1 day etc., but the longer the time period, the more important the support or resistance level is. See for example the forex charts below. On the left is the 1 week candlestick chart of the EUR/GBP and right the 10 min candlestick chart of the EUR/GBP. It is clear that the resistance point on the 1 week chart – 0,9420 – is more important than the resistance point on 0,8645 on the 10 min chart. There is a good chance that the support/resistance level can hold a new attack. In addition, a support/resistance will increase in importance as it has more held attacks. Knowing support/resistance levels can provide a strategic advantage to a trader. There are several reasons for this kind of concentrations. Often it is a psychologically important border. A famous example of the stock market is the 1000 points limit of the Dow Jones. Between 1966 and 1982, this was the resistance that investors could not break. However, the border was hit a few times, but never really broken. After this happened, in 1982 followed the 2, 3, 4 and 5000 points limit quite easy. Another example is the gold price, which from the mid-80 ‘s to the 1990’s did not get over the $ 400. Many novice and recreational forex traders put their stops and profit targets around psychologically obvious targets. At currency pairs as the euro dollar and the pound dollar, for example, often exits and entries are concentrated around the 100, 80, 50 and 20 border. Stop hunting (Definition: dealing rooms of major banks trying to stop position clusters) often takes place around rates around this. Drawing lines for support and resistance is not offered by all brokers, however, brokers supporting the Metatrader 4 trading software platform for forex and more underlying assets have a big advantage. Both EasyMarkets and YouTradeFX offer MT4 trading and thus support and resistance. You can find reviews of both on top of the page in de menu.